Nat Genet. 2017 May 26;49(6):969. PMID: 28546579. Arhinia, or absence of the nose, is a rare malformation of unknown etiology that is often accompanied by ocular and reproductive defects. Sequencing of 40 people with arhinia revealed that 84% of probands harbor a missense mutation localized to a constrained region of SMCHD1 encompassing the ATPase domain. SMCHD1 mutations cause facioscapulohumeral muscular dystrophy type 2 (FSHD2) via a trans-acting loss-offunction epigenetic mechanism. We discovered shared mutations and comparable DNA hypomethylation patterning between these distinct disorders. CRISPR/Cas9-mediated alteration of smchd1 in zebrafish yielded arhinia-relevant phenotypes. Transcriptome and protein analyses in arhinia probands and controls showed no differences in SMCHD1 mRNA or protein abundance but revealed regulatory changes in genes and pathways associated with craniofacial patterning. 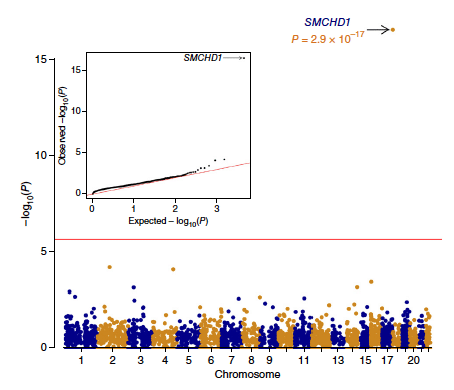 Mutations in SMCHD1 thus contribute to distinct phenotypic spectra, from craniofacial malformation and reproductive disorders to muscular dystrophy, which we speculate to be consistent with oligogenic mechanisms resulting in pleiotropic outcomes.